The most comprehensive safest method to protect your data ion endpoints is full-disk encryption. R&S®Trusted Disk prevents sensitive data from being accessed in the case of theft or loss by securely and effectively enconding hard disks. The full-disk encryption solution encrypts not only the user data, but also the entire operating system and any temporary data. R&S®Trusted Disk uses a transparent realtime encryption method that maintains the smooth running productivity of all working stations. Pre-boot authentication by PIN or hardware tokens add a further security mechanisms. 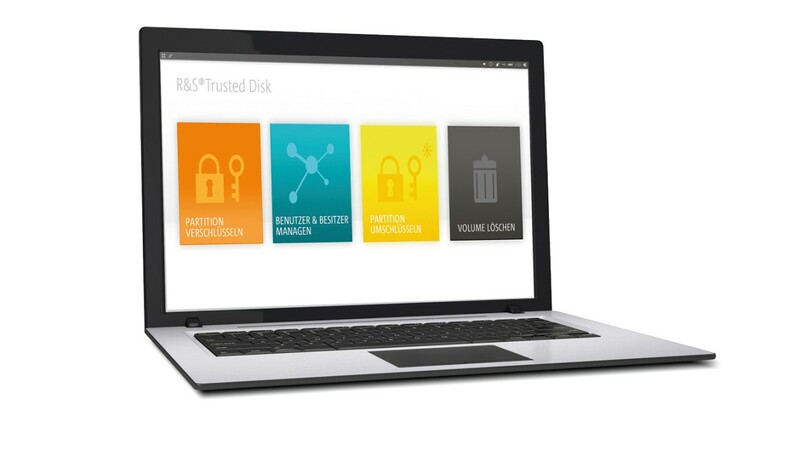 R&S®Trusted Disk provides authentification methods for mobile devices such as USB sticks or external hard disks. TrustedDisk allows easy and safe use of mobile encrypted data storage media – even in mixed environments. R&S®Trusted Disk was developed according to the requirements of the German Federal Office for Information Security (BSI), which includes evaluated random number generation to maintain the highest security level. Via defined security profiles, individual security parameters can be defined for any client. The multilevel hardware-token authentication method ensuring unrivaled levels of security. R&S®Trusted Disk can be easily and quickly installed for single working stations or in corporate networks with mixed environments. Both versions require authentication via hardware token. Mult-user authorization can be configured and changed, enabling enables several users and groups to simultaneously access encrypted storage devices.